The Uganda U17 National team booked a date with host Tanzania in the semi-final of the AFCON U17 regional qualifiers on Wednesday evening. Peter Onen’s side who went into the last game eyeing three points won it in style as they put eight goals past a hapless Djibouti side at the Chamazi Sports complex. 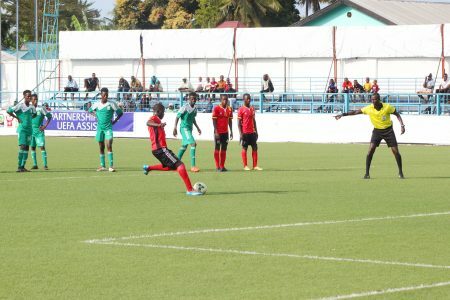 Iddi Abdul Wahid opened the scoring as early as the 9th minute, Kisozi Seed High School forward Yiga Najib netted a hat-trick in 22nd, 46th & 65th minutes. Bright Stars FC Junior team Davis Ssekajja, SC Vipers midfielder Kakaire Thomas also got their names on the score sheet. KCCA FC Soccer Academy player Ibrahim Juma scored a brace, one of the goals coming via a penalty kick. Uganda u17 Head coach Peter Onen could not help but be drawn to the fact that his side is taking in the hosts. “We are playing the hosts and it will be an interesting game, said Onen after the game. “We have improved tactically since our loss to Ethiopia and we expect a vey good game. “We know Tanzania has changed a lot in terms of man power but my boys will be ready. Uganda sealed their date with Tanzania following Ethiopia’s 4-2 win over Kenya in the other Group B game. After all group games were played, Uganda finished second in Group B, three points behind Ethiopia who face group A runners ups-Rwanda. The starting XI against Djibouti. Semwogerere Daniel (GK), Alou John Kokas, Owane Yasin Abdul, Mwaka Polycap, Mukisa Owen, Asaba Ivan.